Dubbed the “School of the Future” for its new style of teaching, the Summit Public School is an educational organization innovating the learning experience. The students at these charter schools take charge of their own learning, driving their daily environment by exploring their passions and interests with the goal of becoming future active, productive citizens. Located in Silicon Valley, Summit Public Schools encompasses 14 schools and serving more than 6,000 students. The schools are supported by a number of prestigious partners, such as the Bill and Melinda Gates Foundation. The videoconferencing system is meant to enable the same natural flow of ideas as meeting face-to-face. Fulfilling such an ambitious mission requires an empowered, world-class school leadership and teaching faculty who can be in constant communication with each other to discuss new ideas and techniques to deepen their students’ knowledge. This level of collaboration is key to keeping the school’s innovative spirit alive and generating the big ideas that work past any learning barriers for their students to provide the ultimate personalized learning experience. To that end, the technology team installed a videoconferencing suite and conference speakerphone at each school location. The videoconferencing system is meant to enable the same natural flow of ideas as meeting face-to-face. Selected for providing the best image and audio quality, this system was meant to create a positive, energized, and inspiring environment for the team to discuss how to enable further success within the schools without having to go offsite—saving time, money, and other resources. However, the audio component of the system posed a significant roadblock to that experience. The team consistently encountered audio outages, poor microphone pickup, and echo that created an increasingly more difficult and frustrating environment for everyone on the calls. Even more aggravating, the audio system started failing when it was turned up past a certain volume, a problem that was only discovered when the leadership team grew and the meetings became larger. The audio level was being raised — often to the maximum output—in an effort to allow everyone to hear what was being said, triggering the system to completely shut down during the meetings. The only way to reset the system was to unplug the device’s USB power cable and reseat it. This became a regular occurrence during every meeting and required the technology department to constantly perform these system resets and check the volume control at each school—a huge burden for the already overloaded technology team. To resolve the issue, the organization first tried training the participants on setting the system’s volume control to a level that wouldn’t trigger the system to shutdown while still providing an adequate volume, but it still didn’t fix the other poor audio quality issues they were experiencing. To solve the other issues, the organization’s chief technology officer (CTO) reached out to the audio provider, who proposed purchasing and daisy chaining more units. However, even with additional expensive units, the issues and the poor audio experience persisted. The CTO decided it was time to look for a completely new solution that would deliver consistent and reliable high quality audio. His research uncovered a promising solution: the Yamaha YVC-1000 unified communications microphone and speaker system. With the help of solutions provider Virtual Graffiti, the school brought in the Yamaha UC system to do a trial run. It made an immediate impact with its plug-and-talk capabilities. It didn’t require any complex system set up or training. 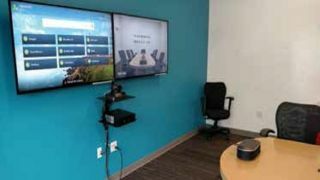 When Summit hosted its first leadership meeting with the new solution, no one complained about the audio and for the first time they felt like they finally had a system that would enable the environment they envisioned for these meetings. The audio was loud, crisp, and intelligible. The microphone picked up all the voices clearly and echo was eliminated. Having had a successful 30-day test phase, Summit bought additional units and started removing the old system that no longer supported them.